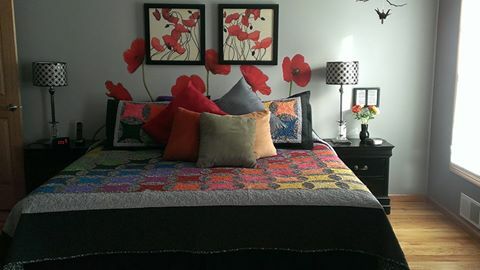 I can create a custom quilt to meet your need and desire as well as budget. Call for your appointment to begin your custom quilt project. Jackie's Sewing Service makes many quilts for customers like the beautiful quilt shown here on the left. Such a special quilt designed around the customers desires, designs and colors. Welcome your new little one with a custom made baby quilt. What makes a baby quilt so special? Custom made baby quilts personalized with baby’s name, birth date, weight,etc.. Beautiful, soft and cuddly, make one of a kind keepsakes. If you need a long lasting, quality gift for a loved one with a new born, a custom baby quilt is an excellent choice! We can also make you a photo baby quilt with your baby’s photo and name on the quilt. We can make a regular size quilt, baby quilt or custom size of your choice. Many ideas and styles are available to select from. T-Shirt / Memory quilts are a great way to remember events, time periods in your life or someone you love that has passed on. You can include pictures of your loved one throughout life and the quilt can be composed entirely of their clothing – T-Shirts, Flannel Shirts, or even plaid cotton shirts. These also make WONDERFUL birthday, anniversary, and Christmas gifts! (Provide electronic pictures (jpeg files sent in an email or loaded onto a USB), I can download your pictures into my computer, print them on printable fabric and sew them right into your memory quilt. Fees: As with any project, my fee is $15.00 per hour, plus supplies used in the making of your quilt. Call me today to discuss your custom T-Shirt / Memory quilt.